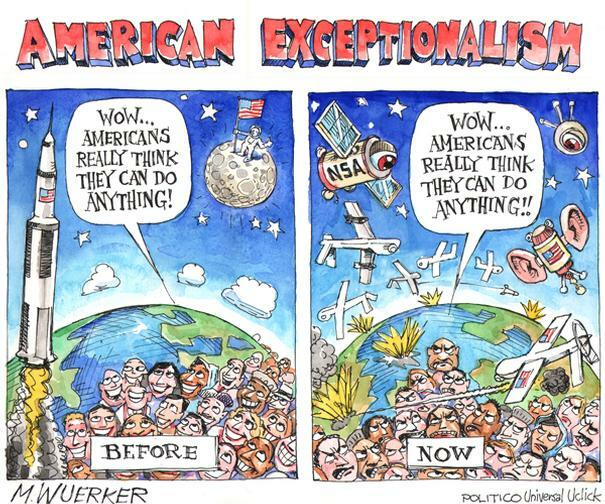 American Exceptionalism is an issue that has been debated on since its introduction in the political arena. It is also a concept that has brought division between liberals and conservatives. The idea of American Exceptionalism refers to the special characteristics the United States has which make it a free unique country that is based on democratic ideals and also personal liberty. A special feature of the country as sometimes derived from the nature the country got its independence, founding of its political institutions, and making of the constitution (Ceaser, 2012). This paper will critically analyze the concept of American Exceptionalism while providing evidence to why America is no exceptional from any other developed countries. As stated earlier, American Exceptionalism has been the center of contention between liberals and conservatives. Liberals are the group of people who would like the citizens of the country to think their country as an ordinary one. The plain meaning that the state is always trying to achieve developments on policies for better living and economic growth while promoting democracy just like any other country in the world is doing. The liberals want the citizens to take the American Exceptionalism down a notch for the country to be able to realize that it is not that exceptional and there is so much the country is capable of doing to reach the outstanding status (Ceaser, 2012). Conservatives have on the other side passionately rallied how America as a country is exceptional. The declaration is made through statements like the United States is “a shining city on the hill,” “the last best hope of earth,” “the empire of liberty” and “indispensable nation” (Walt, 2011). The American Exceptionalism concept has compelled politicians who are running for any political seat to talk of the America’s greatness deeming those that have a different opinion to face criticism. An example is the current president Barrack Obama where he found himself on a hot seat for suggesting that American exceptionalism is no different exceptionalism, like British exceptionalism or Greek exceptionalism. The conservatives in the United States are a unique group of people when comparing with other conservatives from other countries other than the United States. The stands of conservatism in the United States are weaker as compared to those outside. The variation comes in where conservatism in Canada and Europe is inferred from the alliance between the government and the church through history. The conservatives disregard capitalism, Marxism, and materialistic values. Therefore, their politics reflect values like noblesse where leaders protect the less fortunate and the economy at large (Lipset, 1996). Conservatives in the United States prefer a limited Government and advocate for an economy which market forces are reflected by income and not government control. The preference is seen as the fundamental of the county’s Liberty on the domestic level. On the foreign affair level, they hold the State in a high position and reject the idea that the international community diktats can control America. The American conservatives regard the country as the greatest world power hence get a different treatment from other nations. The notion, however, makes the subject one that is contested (Lipset, 1996). The American exceptionalism assumes that the American values, history, and political system are to be admired worldwide. The assumption, therefore, is what causes the criticism on the American Exceptionalism from both external forces and within the country by a group of liberals. The take by the American conservatives blinds them from seeing the faults the country may have on its citizens or humanity hence fail to correct them. There is nothing wrong with being patriotic about your country. However, more harm than good will come out of it if it is done excessively. The exceptionalism presents America as an exceptional country, better than any other, with rare geniuses, God is with the country hence heaven sent and that the country has done most good in the world. There have been major contributions through speeches and writings that lead to people believing that the country was put in place by God to make the world a better place. An example is an address presented by Ronald Reagan. The president stated that he believed that the country was put there by “some divine plan” (Walt, 2011). When the state takes center stage in every activity or significant decision, it is inevitable for the citizens not to believe that their country is heaven sent to liberate the world. A writer by the name Michael Hirsh wrote that the role of America as a country is “the greatest gift the world has received in many, many centuries, possibly all of recorded history” (Walt, 2011). The statement implied that America was a gift from God to the would which also means that people should be grateful for receiving the gift. The statement puts the United States as a very special country one that is supposed to take care of the problems in the world. It is true that the country has made exceptional changes in changing the world. The contributions that the country has made include stabilizing the economy of the world are many. As recorded in the history, there was a great economic depression that took place in the late 1930s to around early 1940s. The United States is among the many countries that were significantly affected and where the problems with the world economy originated. Through the collaborative effort of President Franklin D Roosevelt’s government, the country was able to get back to its normal state hence improvement in the world’s economy. The same thing can be said about the latest global economic depression that took place during the late 2000s and early 2010s. The recession that originated from the United States due to the real estate bubble shock some of the strongest economies in the world. Some of this countries are still recovering from the depression however due to the stabilization of the country’s economy, the world’s economy healing process is rapid. Another contribution that the U.S has made to the world is through interventions and providing aid to war-torn countries in Africa and Asia. The U.S has been a great supporter of the Israeli government in their fight. The country has also been a key player in fighting against terrorism. The contributions are seen through the hunt of various terrorist group leaders. The greatest was having been able to capture the biggest terrorist to have lived and destroyed many lives through radical teachings, Osama Bin Laden. It is an act that has gone down in history, and all that is because of the U.S. The actions, however, do not mean that the U.S is heaven sent to save the world. For example, in the case of global depression, the problems in the world’s economy originated from the United States. As a result, it only shows that the country is no different from others. They have problems of their own too only that they are covered under the umbrella of American exceptionalism. The issue of having problems as a country has vehemently been brought to light by the Republican candidate running for the presidency Mr. Donald Trump. In September last year the candidate was talking about the issue of helping Syrian refugees where he suggested that the country can help with the refugees from the war-torn country as much as it can but the country has its problems too that need to be looked into. The state has made significant contributions to the world, like catching the notorious criminals. However, other countries have made contributions in the world too, like partnering with the third world countries for development purposes. Just like there is a U.S governmental organization called USAID operating in the third world countries, so is there UKAID from the United Kingdom doing the same thing. The notion that the country is the greatest and that it is sent from God to save the entire world is what causes the country to fall into the mistakes that lead to devastating effects like economic depression. It is not the only one making changes in the world; therefore, there is no exception in that. Not as good as the American exceptionalism dictates. U.S.A is a country that has done both good deeds and bad. The concept of American Exceptionalism tries to eliminate and forget about bad deeds that have been done by the country and only regard what is good. U.S is one country that has caused human suffering and deaths like any other. The country had been a major player in racism during the times of Martin Luther King Jr. racism has come to an end in the recent years. Same thing with slavery where black people were taken from their homes in Africa and taken to America to work. The acts were in place during the second world were. During this period, America took the opportunity to build their nation as the others fight. Through the help of the slaves, the country was able to grow very fast since it had free labor. As a result, the industrialization of America was quicker than any other country hence at the end of the war America emerged as the most developed among the others. The war gave the country an opportunity to grow without any limitations since to other countries were too busy fighting. The development of the industrial sector in America meant that there was an extensive development of production companies that emitted harmful gasses. They are the greenhouse gasses which causes an imbalance in the atmospheric temperature. During this time, no organizations were advocating for environmental protection, and nobody cared about the environment all was done is the use of the environment for personal benefits. The U.S was not left out in this therefore despite proclaiming to be good among other countries in deeds. The U.S took a huge part in causing the climate crisis we have today. The country has been connected with advocating for extrajudicial killings in countries affected by terrorism. The killings are conducted to eliminate threats among them being Osama Bin Laden, Saddam Hussein, Mohammed Ghaddafi. Although these people are said to have been bad, some of them had good intentions for their countries. A good example Saddam Hussein, during his reign, he made Iraq be among the progressive countries in Arab. He ensured that the country’s infrastructure had been improved, industries, heath-care systems, education, farming and even raised social services. Even if Hussein committed crimes against humanity, advocating for his killings was not the wise decision. During Reagan reign in the U.S, they saw a revolution of the Islamic Iran a threat hence encouraged Iraq to invade Iran promising support in the form of weaponry, money, and intelligence. The American government provided chemical weapons which caused adverse effects like anthrax, diseases attacking lungs, heart, and spinal cord. The attacks on the country affected the Iran and claimed so many lives. The act would be one of the probable reasons why the Islamic countries do not associate or hate the United States. In a recent interview with CBSN the candidate running for the presidency, Donald Trump admitted on a live T.V that U.S intervened in the killings of Gaddafi and Saddam Hussein yet Hussein is said to have been a C.I.A asset for over 30years. Trump also admitted that it was a mistake to have eliminated these two people because they were not a threat to the country as it was presumed. In his bead for the presidency, Trump slogan for the campaign is the “Make America Great Again.” The statement is another of many slogans that support the concept of American Exceptionalism. The act is just a proof of how far the country is from being good. It advocated for killing lots of innocent people because the state showed signs of being a threat to the U.S. The acts were inhuman to the people showing that America does not care about who it hurts as long as it stays as the most powerful. In the same interview, Trump said that because the North Korea has nuclear weapons and it is a threat to the U.S; he would use his powers to make China seize the country. The decision would create another war that would create a havoc like the one we are facing with terrorism where the rebels are looking to revenge for what was done to their families. The concept of American exceptionalism is a misleading notion to the citizens because it leads to them thinking that the government is always good and in the real sense it has some thinks that no one is proud to admit. It is not perfect as assumed by the concept where it does not have any faults and the continued assumption will only lead to more mistakes and more cover ups while still assuming that we are doing a good thing to the world. The United States is not the only country responsible for all good in the world, therefore, should not take credit for everything. It is also responsible for some bad things hence should assume the responsibility. American exceptionalism portrays America as one great country with values that are respectful to humanity, peace, and one that respects equal rights for everyone. The notion may be to some extent true, but as it has been discussed previously, America caused some of the greatest sufferings human beings endured. Other than the war in Iraq, America has created other problem like over time which can only be looked at, in a historical perspective. As also seen, America would do anything to eliminate competition or any other country that tries to dominate the world or take its place. America stated as a nation with about thirteen states, but due to its expansive nature, the country has acquired more states since 1846 pushing the natives of this states into impoverished reservations (Walt, 2011). The act does not show any respect for humanity nor does it show any respect for peace among its neighbors. The acts were brutal to these citizens who did not deserve to be harassed because they were at their homes. The U.S has also been brutal in killing civilians in several instances where they killed over 250,000 Philippines. It is not better than any other countries because it collaborated with countries like Germany in the world war 2 where they conducted bombings that killed over one million civilians. The recent attack on Nicaragua left over 30,000 people murdered in the country, an operation that was handled by the U.S government. The country has been an advocate of human rights, but it has not been fully open to signing most of the treaties that help in making sure that the rights are looked into within the country. The country refuses to be bound by other powers like the International Criminal Court (ICC) which ensures that those who defile human rights are prosecuted. The refusal may be presumed as double standard considering that the country always wants to have a say on the cases taking place in The Hague-based court. The American presidents have always done what they have thought is right for the country and protecting its position at the top but in the process, they have not fulfilled the duty of protecting human rights. Instead, they have protected the interests of the nation. Therefore, the notion of the country being superior in taking the high road is not true. For America to be a truly exceptional state like it wants to be, it has to forget about American Exceptionalism. It is a misleading notion which only leads the nation to think of itself as superior and better than any other. The concept blocks all forms of improvement if there would be any. This is because, if a nation thinks of itself as the best, there is no room for improvement, only a place for maintaining the perfect picture. Hence the slogans and the undercover operation to diminish any power that may want to overthrow the U.S from the position of being the most powerful country. It is true the country is unique in various aspects but in order the make it as exceptional as the notion dictates, an evaluation of the entire concept needs to be done so that the over-hyped characteristics of the country can be looked into and corrected.